This is the third time in the past month that I’ve mentioned my bullet journal and bullet journalling in general, but I’m honestly completely obsessed by it. I also promise I’m not being paid to promote Linda’s Bullet Journal post, given that this is also the third time I have linked to it, but it’s one of my favourite posts I’ve ever read. The whole world needs to bullet journal. So I got my bullet journal mid-September, so decided to start tracking everything from October. I was pretty much on countdown for the last few weeks of September because I was so excited to start properly filling it out and making it pretty and full, but I suppose it gave me time to research different pages and properly set out my pages and get creative before just jumping straight in. I’m going to focus just on the October pages for this post but I may do an updated post on just the random pages I have at the start. So, we have the monthly spread which I’m going to use to help me track events and important things that I have to remember. I think it really helps having the whole month laid out in front of me – I can see exactly when I’m busy and exactly when I’m free. I also have a little section at the side for my monthly goals, which get coloured in when I’ve achieved them. There’s not many at the moment, the biggest one is just to complete Blogtober and that will be furiously coloured in when I complete it, because I WILL complete it. I also have a place to note down how much I got paid in September, so I can work out some budgets. Obviously I have covered how much I got paid because it’s not something I want to share, and there’s a few events covered because they’re really exciting and I’m waiting for the right time to share them. Ooooh mysterious. On the subject of money, my next page is a spending tracker. I’m going to be noting down the date, what I’ve bought, where from, how much it was, and whether I used cash or card. It may seem extensive but I’m really trying to be better with my money and keeping of track of it in depth is just the first step into actually managing to save. I think I was a bit optimistic only have one small page to track my spending, I’m definitely going to have to draw out another one. I don’t know who I was trying to fool. I have a shopping list on the opposite page, which is split into needs and wants with little ticky boxes to mark whether I ended up buying it or not. I have a feeling the wants list will be a heck of a lot longer than the needs list. I’m going to be tracking my sleeping patterns in this funky little table that took enormous patience to write out (too. many. numbers.) and also tracking my habits and moods, hopefully I’ll start to see some sort of correlation between how much I sleep and what things I get done and how I feel on that particular day. I think I’m the most excited about these pages, whether it’s because I get to colour in the boxes and that’ll look really cool at the end of the month or whether it’s because I’ll be better in tune with myself and my moods. Unsure. 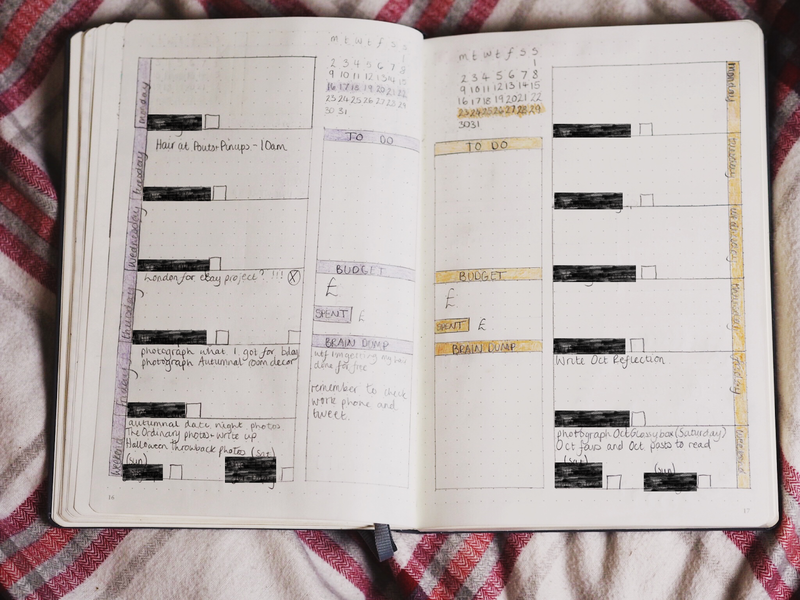 We then have the weekly spreads, which will help me to plan my days more in depth. I’m noting down to-do lists, events, places to be and just in general things that need to be done.I’m quite a boring person so I feel like the weekly spreads might be a little bit sparse sometimes but that’s alright. I think this will come in handy for keeping track of what blog posts are going up when – I am scheduling in advance but my brain is going to be so full that I will absolutely forget what I’m doing. I always write down things I want to get done and they end up not getting done or I do something completely different, so planning out my days almost seems kind of pointless. I suppose I’ll get into a routine with this sort of thing though, I’m not a big daily planner so that’s what the bujo is here to change. I’m excited to be super creative with this journal, I don’t want to stick to a uniform style of illustration so I’m going to experiment a lot. I’m kicking myself that it took me this long to actually start a bullet journal, it’s one of the best decisions I’ve ever made and I would highly recommend it to anyone, even if you don’t think you’re that creative, I promise you, that side of you exists and this is a perfect way of letting it show.